By using the FlightPath maneuver system* (licensed from Fantasy Flight Games), players engage in exploration and combat, traversing sprawling Star Trek space maps made available via an in-store Organized Play program. 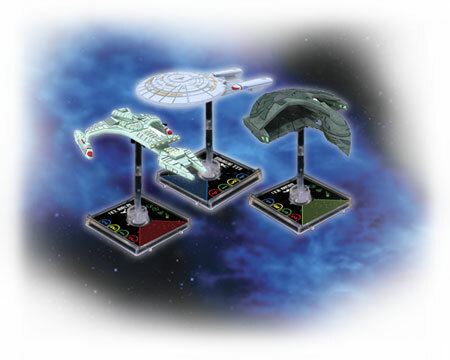 As commander, players have the ability to customize, upgrade, and assign famous crewmembers to their fleets, which feature ships from the series' prominent empires and forces as well as special stats and abilities, and unique maneuvers on separate HeroClix Combat Dials. Star Trek: Attack Wing is a standalone game which uses the core rule set of FFGs' FlightPath game system with a Star Trek twist, but is not compatible with other FlightPath games from FFG. The FlightPath maneuver system used in Star Trek: Attack Wingis based on the original game design by Jason Little. I’m not a Trekee or a Trekker, nor have I played the Star Wars themed game this one is similar to. This game has pre-painted ships that fly around and blast each other. There are cards that convey special abilities, strategies to formulate and follow, and fun to be had if you don’t mind rolling lots of dice. A game of 3 ships on each side will take about an hour, some of which will be setup time. What’s not to like about starships slugging it out? It is thematic and not terribly difficult to learn (15 minutes for a seasoned gamer). Ships can be customized to some extent by adding or subtracting upgrades, or swapping commanders. Play is streamlined so much that it would not be unusual for a 1 on 1 ship battle to end in 15 minutes. I can’t decide if this game is “simple and elegant” or “too simple.” I love games like Mage Wars that have a wide variety of traps and options at every point. With ST:AW I find that the most effective strategy is simply to close with the enemy and slug away with a main weapon, turn, and repeat until one or the other ship is gone. True, there are cards that add slight modifiers or subtle abilities, but ships don’t last long enough in this game to develop truly deep gameplay. This game belongs in a collection where someone wants to play a deeply thematic game that is fun but not terribly taxing or time consuming. Star Trek: Attack Wing is a game from WizKids that uses the Flight Path System created by FFG for X-Wing Miniatures game and before that Wings of War which was sold and became Wings of Glory. They use the system to represent capital ship combat instead of fighters. I am a fan of both Star Wars and Star Trek, but this game is only good for the real die hard Trekkies who need everything Star Trek. The quality on this one is really disappointing. Since this is a WizKids game the models really bad. This is amplified by the point that they are sold for the same cost as the FFG X-Wing ships. The plastic of them is horrendous, and the pre-paint on them is not really passable. This makes them feel like a rip off compared to the quality and price point of FFG’s X-Wing Miniatures game. Also the game will have exclusive ships, cards, tokens, etc that you can only get through tournaments that will be extremely powerful and game breaking. They already have released tournament exclusive dice that have no blanks on them, so those that have those have a higher chance of crits, hits, evades, etc. Remember these are legal to use from now on. This has been their business model since MageKnight came out and it really needs to change. -Easy to pick up, especially if you have played X-Wing Miniatures game. -Great if you are a Star Trek fan. -Really bad components. The ships themselves are made of awful plastic and not that good looking. Plus they are the same price as the FFG X-Wing ships. This makes these ships overpriced. -Need to do tournaments and be willing to spend a lot of money to get tournament exclusives to be remotely competitive. 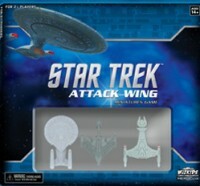 Add a Review for "Star Trek: Attack Wing"